The shogun was the highest ranking position in the noble military class during feudal Japan. Although the shogun was ranked below the royal class, he was often considered more powerful and the actual leader of the country. Shoguns lost political power and authority at the end of the Edo period and the beginning of the Meiji period. The shogun is very much like the prime minister in today’s Japan. The term, a shogun, directly translates to troops general. The government that was ran under the shogun in feudal Japan was called shogunate, shogunshoku or bakufu. The shogunate government system was introduced by Minamoto no Yoritomo, the first Kamakura shogun. The term bakufu simply means ‘tent office’. This was due to the fact that the headquarters were initially set up temporarily, often on the battlefield. The bakufus in feudal Japan included Kamakura bakufu, Ashikaga bakufu and Tokugawa bakufu. Sakanoue no Tamuramaro a legendary shogun on horseback. What shoguns wore in feudal Japan can be evident from the portrait drawings from the period. In the drawings, shoguns are often seen sat down on a zabuton, a traditional Japanese cushion on the floor, wearing long black kimonos along with a black hat. However, it is believed, in everyday life, shoguns also wore warrior armor, similar to what were worn by samurais and daimyos. Following the Genpei War, Minamoto no Yoritomo became the first Kamakura shogun in 1192 who decided to base the government in the city of Kamakura. There were in total of 9 shoguns during the Kamakura period. 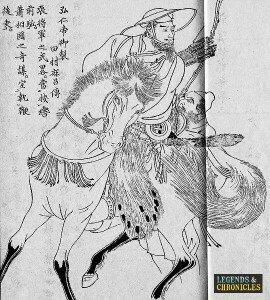 Other Kamakura shoguns were: Minamoto no Yoriie, Minamoto no Sanetomo, Kujo Yoritsune, Kujo Yoritsugu, Munetaka, Koreyatsu, Hisaaki and Morikuni. The Kamakura shoguns were considered the most powerful compared to the ones in later periods. 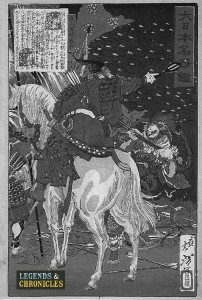 Following the fall of the Minamotos, Ashikaga Takauji became the shogun in 1338. There were 15 Ashikaga shoguns in total. During the Ashikaga period, the political power of the shogun was significantly weaker than the Kamakura shoguns. This was due to the shogun having very little territories of his own. This led the shogun to rely heavily on daimyos who owned large amount of private land and how powerful the shogun was actually very much dependent on how many daimyos he had. For these reasons, daimyos became so powerful that the Ashikaga government was defeated by one of the daimyos, Oda Nobunaga in 1573. Ashikaga Yoshiaki was the last Ashikaga shogun. Sakanoue no Tamuramaro a shogun in the Heian period of feudal Japan. The period between the end of Ashikaga period and the Edo period, there were no shoguns, instead country was ran by powerful daimyos including Oda Nobunaga and Toyotomi Hideyoshi. The first shogun of the Edo period was Tokugawa Ieyasu who was already a powerful figure. Tokugawa Ieyasu had been a daimyo previously and had been through a number of civil wars in which he achieved victories. There were 15 shoguns in the Edo period, with Tokugwa Yoshinobu being the last ever shogun of the period and furthermore, in the entire Japanese history. The Tokogawa shoguns focused on controlling the trades with foreign countries and introducing Christianity, as well as the military aspect. Throughout the Japanese feudal period, shoguns were those considered as the head of samurais. However, there was a three year period following the Kamakura shogunate, between 1333 and 1336, where this was not the case. The Kenmu restoration reclaimed the power of the emperor and once again, Japan was ruled by the royal family. The leaders during this period included Prince Moriyoshi and Price Narinaga. However, this was short lived due to the rise of Ashikaga shogunate, which was lead by Ashikaga Takauji. There were also no shoguns for around 30 years after the fall of Ashikaga shogunate, when the country was controlled by some of the most powerful daimyos.